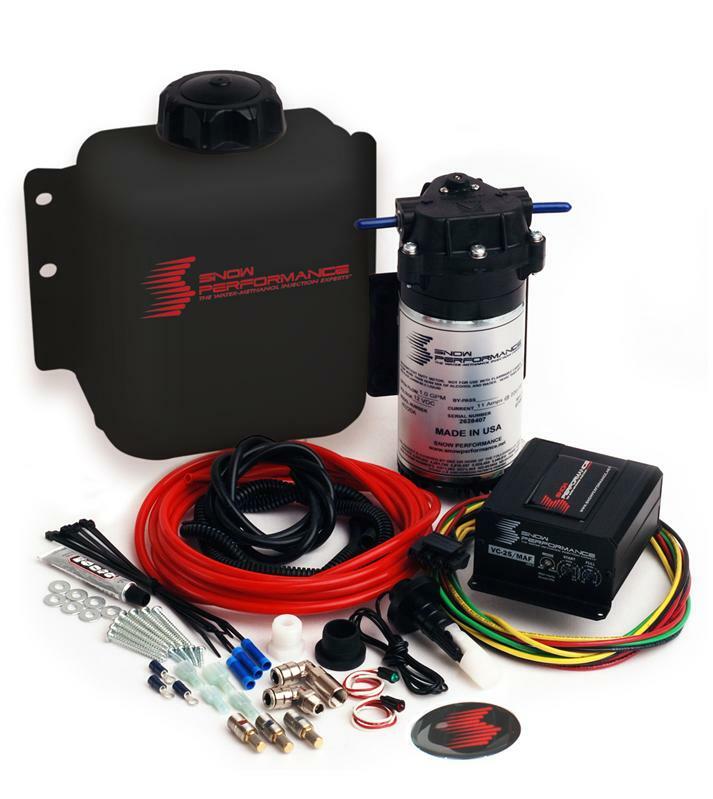 The Snow Performance Stage 2 MAF/MAP water-methanol injection system is designed for all naturally aspirated/forced induction vehicles utilizing a Mass Air Flow (MAF) sensor or Manifold Absolute Pressure (MAP) sensor. The Stage 2 uses a progressive controller that proportionally injects more or less water-methanol according to MAF/MAP output. Start and full points are adjustable for engagement and delivery curve to match what the engine requires. Proportionally injecting according to MAF/MAP sensor input gives an accurate delivery of water-methanol for small fast spooling turbos and positive displacement superchargers that hit boost almost instantly and allows the most accurate injection curve which translates into the highest cooling and performance gains. Proven to deliver 20-35 HP and 45 FTLB of torque on all naturally aspirated applications and 50-80 HP increases and up to 100 degree drop in air temps for all positive displacement superchargers and small fast spooling turbos! The Stage 2 comes with a MAFU controller that can be mounted any where in the engine bay or cab for a clean install and comes with the industry leading Snow Performance 300 PSI UHO pump and Hypersonic Nozzles™ for the absolute best atomization and power available for your vehicle.